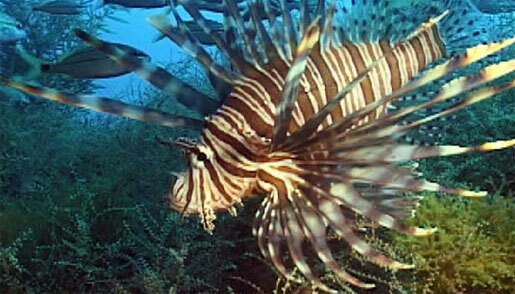 Avoid consuming lionfish from locations known to be affected by ciguatera toxins. Check with local and state authorities if in doubt. Learn more about ciguatera from the Centers for Disease Control and Prevention. The lionfish, a longstanding showstopper in home aquariums, is a flourishing invasive species in U.S. Southeast and Caribbean coastal waters. NOAA scientists are launching a campaign to help hold their growing numbers at bay. The lionfish, a native of the Western Pacific Ocean, is a venomous, voracious predator that’s flourishing in coastal waters of the U.S. Southeast and the Caribbean. In North Carolina alone, local densities have increased 700 percent between 2004 and 2008, according to scientists from NOAA’s National Centers for Coastal Ocean Science. This invasive species has the potential to harm reef ecosystems because it is a top predator that competes for food and space with overfished native stocks such as snapper and grouper. Scientists fear that lionfish will also kill off helpful species such as algae-eating parrotfish, allowing seaweed to overtake the reefs. In the United States, the lionfish population, which inhabits the coast from North Carolina to South Florida, will likely continue to increase in the coming years. This is largely because lionfish have no known predators and reproduce all year long; a mature female releases roughly two million eggs a year. Fortunately for our coral reefs, the flashy lionfish has caught the attention of the hungriest predators of all: People! Once stripped of its venomous spines, cleaned, and filleted like any other fish, the lionfish becomes delectable seafood fare. NOAA scientists researching the lionfish’s spread and impact are encouraging a seafood market as a means of mitigating the species’ impacts on reef communities. To promote awareness of the lionfish as a good mate for one’s dinner plate, scientists developed the “Eat Lionfish” Campaign, which will officially launch on June 11 in Washington, DC, at the Smithsonian Institution’s Savoring Sustainable Seafood reception. In the Sant Ocean Hall of the Smithsonian’s National Museum of Natural History, renowned DC chef and sustainable seafood advocate Barton Seaver will prepare lionfish ceviche-style, which is a “cooking” method that uses citric acid. This will be the first in a series of events designed to introduce chefs and the public to the lionfish.